I am very important to Jesus! I may not be important to some people, but Jesus really cares for me. He even knows how many hairs I have on my head. He has them all numbered! He said, "…the very hairs of your head are all numbered" (Matthew 10:30). A best friend is one who loves you just the way you are, and yet helps you to be all you can be. Jesus is my special Best Friend because no one has ever loved me as He does. He loved me so much that He gave His life for me. And He loves me today just as much as He did then. Jesus said, "Greater love has no man than this, that a man lay down his life for his friends" (John 15:13). What about things that are not mentioned in the Bible? In this case I should ask, "Would Jesus like to see me do this?" If I think that He would not like to see me do it, I must NOT do it! He is special because He is God's Son Jesus. He is special because He is always there when I need Him. I talk to Him a lot. My special Person is nice and forgiving. He came to be special to me when I went to church and learned about Him. I felt even more love for Him when I read my Bible in my room. I chose Jesus as my special Person because He is the most important Person in my life. I always put Him first in my life. I always trust Him to lead my path. If I am ever in trouble, He can always help me. I really love Him and He loves me even more. I cannot imagine ever living without Him. I never go to bed alone, I never am alone because Jesus is always there. Have you ever felt like you are alone? Have you ever been afraid? You don't have to be afraid and you don't have to feel alone because Jesus is always there. He is truly my special Best Friend! 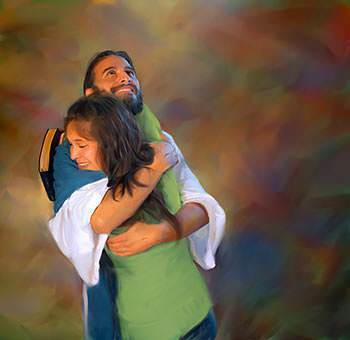 Jesus is my special Best Friend because He always has time for me. I can talk to Him at any time. I can talk to Him in any place. No one cares for me like Jesus. He wants me to come to Him about everything that concerns me. Jesus is my special Best Friend because He is always the same. In the past I have had friends, and somehow they changed and we were no longer friends. But Jesus never changes! The Bible says, "Jesus Christ the same yesterday, and today, and forever" (Hebrews 13:8). The Lord Jesus is always the same wonderful Person who loves me with all His heart. He is always there to listen to me, to help me, to encourage me. He is truly the best Friend I could ever have. 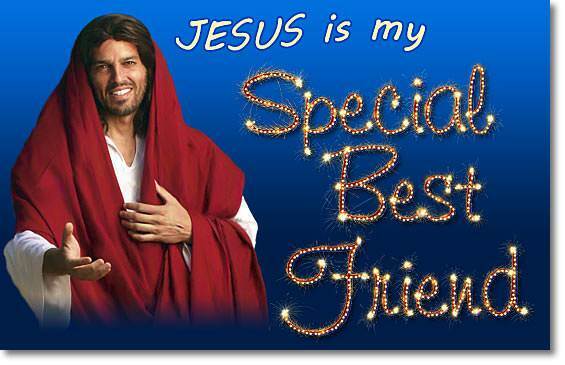 Jesus and I are "Best Friends forever," but I must never forget who He is. He is my Savior, My Lord, and my God, and I treat Him with respect and reverence. I do not call Him "the Man upstairs." "In the world you shall have tribulation [many troubles]; but be of good cheer; I have overcome the world" (John 16:33). Jesus has all power in Heaven and in the earth, and He is always for His believers. Every moment, there on the throne, He is thinking about me. He wants me to tell Him everything that concerns me. He wants me to bring all my problems and burdens to Him. He wants me to tell Him all that is on my heart. The Lord Jesus Himself is in Heaven, seated at the right hand of God the Father, but He also lives in the hearts of His believers by His Spirit. The apostle Paul said, "Christ lives in me!" You and I can say this too. Jesus promised that He will never leave us. He said, "I will never leave you, nor forsake you" (Hebrews 13:5b). Since Jesus is always with me, I must ask myself some questions: Is the Lord Jesus pleased when I am around those who are using bad language? No, He is not. Is Jesus pleased when I am watching a TV show or movie with bad stuff in it? No, He is not. Does Jesus enjoy listening to music that has dirty words in it? No, He does not. This means that I must not hang around those who use bad language. I must not watch bad stuff, and I must not listen to music with dirty words. Wherever I go, the Lord Jesus goes with me. Whatever I watch, the Lord Jesus watches it with me. 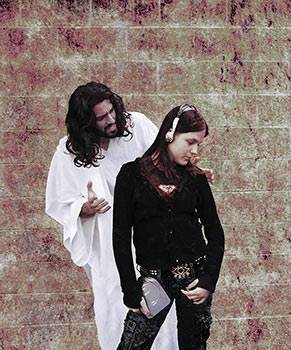 Whatever I listen to, the Lord Jesus listens to it also. If I truly love the Lord Jesus, I will not want to do anything that displeases Him. Jesus is not a "force"; He is a Person! He wants me to love and appreciate Him. He wants me to enjoy Him, the way best friends enjoy each other. The way to enjoy a person is to love that person. The more you love Jesus, the more you will enjoy Him. When you fall in love with Jesus, you will be a happy child of God. The Lord Jesus is the most wonderful Person in all the universe. God tells me to rejoice in Him—who He is and what He has done for me. No matter what happens, I can always rejoice in Him. The Bible says, "Rejoice in the Lord always…" (Philippians 4:4). Maria told her mother about everything she had done including her lies. Maria's friend Susan learned about God's forgiveness. For the next few days, Maria was very sick. Her head and chest ached and her temperature was high, even after taking the medicine prescribed by the doctor. Her parents often looked worried as they bent over her bed. Steven came to sit with Maria each day after school. 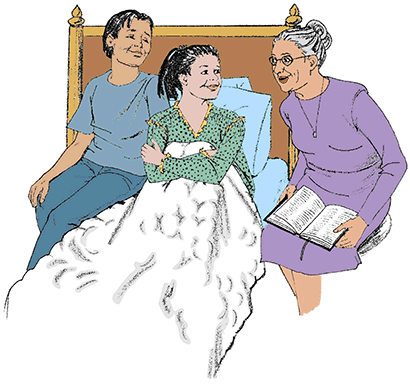 One day when he was sitting beside her, Maria whispered to him, "I want to see Grandma. Do you think Mommy and Daddy would let her come?" "I will ask Daddy if she can come," Steven said, getting up. The next day Maria dozed off to sleep for a few moments and when she woke up, there was her grandmother sitting next to her bed. 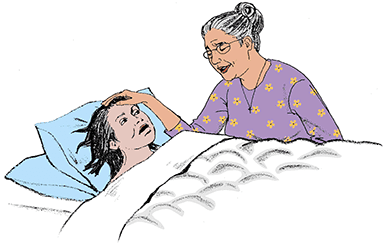 She smoothed Maria's hair back from her hot forehead and talked to her in a soft voice. Maria gave a tired sigh. "Oh, Grandma, I prayed that you would come. And now you are here. God does listen to us, doesn't He?" "Yes, Maria," Grandmother answered. "Steven told me that you both belong to Jesus. Now God is your heavenly Father and you are His child. He loves you, Maria, and He wants you to ask Him for everything you need." "I just needed you," Maria said as she fell asleep again. The next afternoon Maria's father came to sit with her while Grandmother was resting. "Would you like me to read to you, Maria?" he asked. "Yes," Maria answered. "Read to me about the 'Lamb's Book of Life' where my name is written." "What book is it in, Maria?" he asked. "It's in Grandma's Bible there on the table," Maria told him. "I think she left it open at the right place." Her father picked up the Bible and found the verse—Revelation 21:27. He read it out loud. Then he said, "It seems to say that those who do bad things and tell lies cannot got to Heaven, but only those whose names are written in the Lamb's Book of Life. Do you understand it, Maria?" "Yes," Maria answered. "Grandma explained it to me. You know about my lies, but I asked Jesus to forgive me and come into my heart. And I know He did. Now I am not afraid to die, because I know I will go to live with Jesus in Heaven." "You are not going to die," her father said quickly. "Don't even think about such things, Maria!" Maria smiled. "But, Daddy, I like to think about Heaven and about my name being written in Jesus' beautiful book. Is your name in the book, Daddy?" "I guess not, Maria. I have been too busy to think much about it," he said. Maria lay quietly for a while. She watched her father as he looked through the Bible, stopping now and then to read silently. He seemed to have forgotten all about her. At last Maria said, "Daddy, you could come to Sunday school with us. Maybe that would show you the way to Heaven so you could get your name in Jesus' Book." Maria's father leaned toward her and whispered, "Don't worry, young lady. You have shown me the way clearly enough. I am just not ready yet. But I promise to think about it. Now, it is time you went to sleep." A few days later Susan came to see Maria. "Oh, Maria," she said, "I am sorry you have been so sick. Miss Wilson gave me your books and said I could help you catch up on your lessons. She said it was one way I could show you how sorry I was for spoiling your notebook." "You told her?" Maria said, surprised. "I am glad, Susan. Now she knows that I was telling her the truth." "Yes," Susan said. "And when I told her that I had asked Jesus to come into my heart, she said she was going to let us both participate in the camp contest. She liked it that we told her about the wrong things we did." "That is wonderful!" Maria said. "I hope we can go together, Susan." The girls were still working on lessons when Grandmother came into the room. They told her all about what Miss Wilson had said. Then Grandmother asked, "Maria and Susan, do you think you will ever do anything wrong again?" "I hope not," Susan said, "but maybe…"
"Jesus can keep us from doing bad things." Maria added. "You are both right," Grandma said. "Because Jesus is living in your heart now, you won't want to do bad things. But sometimes you will do wrong. Just remember that Jesus is ready to forgive you. And He will help you to do what is right, if you ask Him." "I am going to ask Him every day," Susan said as she got up to leave. That evening when Grandmother had finished reading the Bible to Steven and Maria, Maria asked, "Grandma, do you think Mommy and Daddy will take Jesus as their Savior?" "Yes," Grandmother answered. "If we pray for them and keep showing them that Jesus changes us." "I think Mommy will pretty soon," Steven said. "This morning when I took out the trash for her, she asked me why I did not complain anymore. I told her it was because I had Jesus in my heart." "And Daddy promised to think about it, too," Maria told them. "Now, if only you could stay with us, Grandma, everything would be just right." "Well, I have a surprise for you," Grandmother said with a smile. "Your parents have arranged for me to spend the weekends with you." "Great!" Steven shouted. "No more Uncle Bill's." "Oh, Grandma," Maria said. "I have my name in Jesus' beautiful book. And now I will have you, too." Maria's eyes sparkled. Her heart was filled with joy.